Providence Marseilles, Monaco (Feb-Apr voyages only), Naples, Palermo, Algiers, Lisbon, Providence, New York. 1) New York, Boston, Lisbon, Algiers (Providence - one voyage only), Palermo, Naples, Marseilles. 2) New York, Boston, Lisbon, Palermo, Naples, Piraeus (Providence only), Beirut, Alexandria, Marseilles. 1) New York, Boston, Lisbon, Tangier, Algiers, Palermo, Naples, Villefranche, Marseilles. New York, Boston, Ponta Delgada, Lisbon, Tangier, Algiers, Palermo, Naples, Villefranche, Messina, Piareus, Istanbul, Beirut, Haifa, Jaffa, Port Said, Alexandra, Malta, Syracuse, Marseilles. 1) Marseilles, Alexandria, Jaffa, Beirut, Istanbul, Piraeus, Sicily, Funchal, Ponta Delgada, Horta, Providence, New York. 2) Alexandria (optional), Jaffa, Beirut, Istanbul, Piraeus, Sicily, Algiers, Funchal, Ponta Delgada, Providence, New York. 3) Marseilles, Alexandria, Jaffa, Beirut, Istanbul, Piraeus, Sicily, Funchal, Ponta Delgada, Providence, New York. 4) Alexandria (optional), Jaffa, Beirut, Izmir, Piraeus, Sicily, Algiers, Ponta Delgada, Horta, Providence, New York. 1) New York, Providence, Horta, Angra, Ponta Delgada, Algiers, Piraeus, Beirut, Jaffa, Alexandria (optional). 2) New York, Providence, Horta, Angra, Ponta Delgada, Funchal, Piraeus, Salonici, Istanbul, Constanza, Beirut, Jaffa, Alexandria, Marseilles. 3) New York, Providence, Ponta Delgada, Algiers, Piraeus, Salonici, Istanbul, Constanza, Beirut, Jaffa, Alexandria (optional). 4) New York, Providence, Horta, Angra, Ponta Delgada, Funchal, Piraeus, Beirut, Jaffa, Alexandria, Marseilles. 1) Marseilles, Alexandria, Jaffa, Beirut, Constanza, Istanbul, Izmir, Piraeus, Sicily, Funchal, Ponta Delgada, Horta, Providence, New York. 2) Jaffa, Beirut, Constanza, Istanbul, Piraeus, Sicily, Algiers, Funchal, Ponta Delgada, Providence, New York. 3) Marseilles, Alexandria, Jaffa, Beirut, Constanza, Istanbul, Izmir, Piraeus, Sicily, Ponta Delgada, Horta, Providence, New York. 4) Marseilles, Alexandria, Jaffa, Beirut, Constanza, Istanbul, Izmir, Piraeus, Sicily, Funchal, Ponta Delgada, Providence, New York. 1) New York, Providence, Ponta Delgada, Funchal, Algiers, Piraeus, Istanbul, Constanza, Beirut, Jaffa, Alexandria. 2) New York, Providence, Angra, Ponta Delgada, Funchal, Algiers, Piraeus, Salonici, Istanbul, Constanza, Beirut, Jaffa, Marseilles. 3) New York, Providence, Horta, Angra, Ponta Delgada, Funchal, Algiers, Piraeus, Salonici, Istanbul, Constanza, Beirut, Jaffa, Alexandria, Marseilles. 4) New York, Providence, St. Vincent, Las Palmas, Funchal, Algiers, Piraeus, Salonici, Istanbul, Constanza, Beirut, Jaffa, Alexandria, Marseilles. Banfora Marseille, Algiers, Casablanca, Dakar. 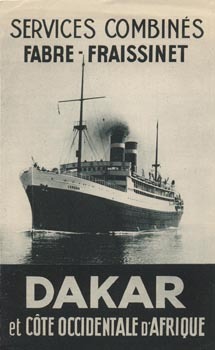 Return voyages: Dakar, Las Palmas, Casablanca, Algiers, Marseilles. Touareg Marseille, Algiers, Casablanca, Dakar. Return voyages: Dakar, Las Palmas, Casablanca, Oran, Algiers, Marseilles. Return voyages: Dakar, Oran, Algiers, Marseilles. Cap des Palmes Marseilles, Dakar. Return voyages: Dakar, Algiers, Marseilles. See the archives section for more brochures of Fabre Line. 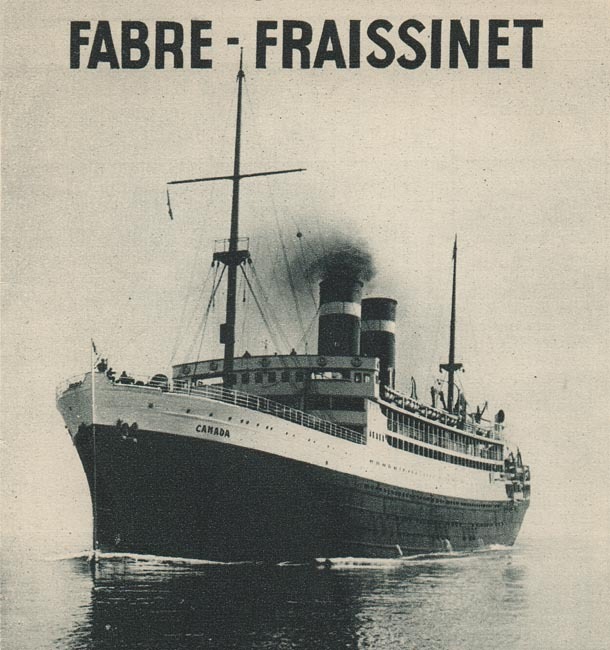 See also Fraissinet, the company with which Fabre merged in 1955 to form Compagnie de Navigation Fraissinet et Cyprien Fabre. You may use my images on another website. and preferably provide a link to my Introduction page. This page last updated April 7, 2009.